Ness has been very successful in delivering solutions for IT Operational Analytics to its customers and we look forward to their distribution of jKool and AutoPilot to their existing and new customers, said David Mavashev, CEO Nastel Technologies..
Nastel Technologies, a leading solution for Application Performance Analytics and its spin-off jKool, a leading SaaS solution for Operational Intelligence and Application Analytics, jointly announce NessPro as their official reseller in Israel. NessPro, a division of Ness Technologies is providing sales and support in Israel for the Nastel AutoPilot® line of application performance solutions as well as the jKool® solution for real-time operational intelligence. Nastel AutoPilot is the chosen APM solution for over 200 Fortune 500 and Global 2000 corporations, Nastel AutoPilot has earned a reputation for helping companies significantly reduce the frequency and duration of costly application outages. 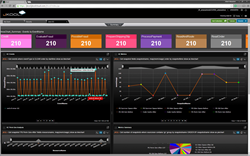 By providing real-time analytics and transaction tracking across multiple event sources, Nastel AutoPilot is able to evaluate situations in IT Operations as a whole as opposed to just individual events. This powerful approach can infer a root-cause from multiple events and deliver meaningful, actionable alerts at the same time it prevents false alarms. jKool’s instant analytics provides immediate value to DevOps and IT Ops professionals who need to find and fix problems faster, improve application performance and enhance end-user experience. These users can leverage jKool’s ability to analyze and visualize both historical and real-time data and provide answers immediately. Typical use cases include: analyzing Java Garbage Collection behavior, detecting security issues and acquiring instant insight into business outcomes through real-time analysis of machine data. Businesses will benefit from greater customer satisfaction as they deliver high quality application experiences to their customers. "The representation of jKool and Nastel AutoPilot strengthens the position of NessPRO in providing IT Operations analytics (ITOA), the next generation of command and control systems in the Big Data world," said David Bismuth, Director of Management Solutions monitoring and security in NessPRO. "ITOA creates the necessary insights to help businesses achieve their goals. Tools in the field of ITOA automatically focus on IT activities, in terms of the relevant events in high-risk business systems and the computing environments that host them." “We are excited to have Ness as our reseller in Israel,” said David Mavashev, CEO of Nastel Technologies. “Ness has been very successful in delivering solutions for IT Operational Analytics to its customers and we look forward to their distribution of jKool and AutoPilot to their existing and new customers”. Nastel Technologies is a global provider of application performance monitoring solution with real-time analytics, comprehensive transaction tracking and forensics. Nastel is a privately held company headquartered in New York, with offices in the U.S., the U.K., France, Germany and Mexico, and a network of partners throughout Europe, the Middle East, Latin America and Asia. For more information, visit us at http://www.nastel.com. jKool, a spin-off from Nastel Technologies provides open source technology and a cloud-based service to provide real-time operational intelligence, analytics and visualization from streaming data for DevOps as well as applications in the Internet of Things (IoT), Retail, Finance and Digital Healthcare. Differentiating via ease-of-use and scale, jKool helps developers, DevOps, IT Ops, data scientists and business analysts visualize, analyze and detect trends, providing them with real-time insight into their data. For more information about the company, visit http://www.jkoolcloud.com. Ness is one of Israel’s leading companies in the field of information systems, having reached this status thanks to our employees. As our main asset, for more than 15 years our employees have been and continue to be responsible for the cementing of our core business and the values on which the loyalty of our customer relationships is based. As a company with 60 years of accumulated experience in responsible and successful management of some of the largest and most complex projects undertaken in Israel, we implement practically what it means to be the leading BSM company in Israel: utmost professionalism, implementation of quality processes and complex methodologies, risk management, training of skilled manpower who possess both business savvy and technological knowledge, and punctual project delivery to customer's absolute satisfaction.